It was my husbands 50th birthday (and he was born in 1955), so a 1950s party theme seemed appropriate. In keeping with this theme, we wanted to do a 50's diner. We hired a couple of caterers for the day, and they were worth their weight in gold. Best party we ever had. Served hamburgers, hot dogs and french fries, in vintage-style cardboard serving baskets (remember them? ), with the best burgers in town. Guests ordered their food at our make shift dinner and we were free to have fun. 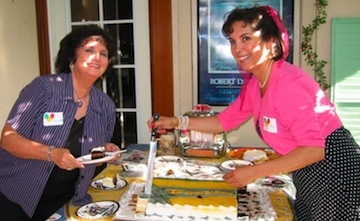 This made the food planning simple, and with the help of two professional caterers we hired by the hour ($35 ea per hr), everyone ate well, and my husband and I were able to focus on having fun at our first 1950s party. It was great that people could eat when they wanted. Just walk up to the diner and order. Our daughter Sierra, (pictured above with Andy), dressed as a carhop, and helped serve. Our other daughter, and nephews helped park cars. We had a great turn out so parking cars turned out to be a big job. Some of Andy's friends even showed up in classic cars (Andy is a car guy). Guest included high school friends Andy had not seen in 35 years, and nearly everyone dressed 50's. A very special memorable party! My brother standing in front of the diner, in his 50's style shirt. 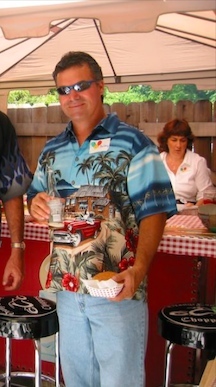 His burger practically disappears in that shirt. In the house, I had a display of photos from all the special times in Andy's life, and 1950's monster movie posters everywhere. We made sure we had the freshest buns and trimmings, as well as a great quality burger. It was a hit! Even my vegetarian friends said it was the best meatless burger they ever had. The fries were deep fried right on the spot, in a deep fryer, and the burgers were barbecued on our back yard grill, pulled up to the diner area. I loved NOT having to worry about filling serving bowls, keeping things hot, or keeping the flies away. Also didn't need to worry about anyone going hungy. Food was always there made to order. The caterers cooked, cleaned, served, and before they left, they prepared plenty of food for the evening. It was like we were guests at our own party. Total cost of caterers was $300 for the whole day and we did nothing regarding food. The cake was a sheet cake I ordered from Safeway bakery. It was a big 1957s Chevy tail fin. Here's a photo of my mom and I cutting the cake. The cake design wasn't great, but it was delicious. We set up a $100 tent over an otherwise unused part of the yard just for the 1950s party diner. Then we set up 3 tables out of plywood, which we supported with old tables and saw horses (whatever works that's safe & sturdy; even folding tables). Then secured it with screws where necessary. Covered with red picnic tablecloth we bought by the roll at the party store or fabric store. When the party was over, we just folded up the table clothes and unscrewed it. It was important everything was sturdy since the caterers would be using a deep fryer for fresh fries all day, and a lot other heavy, hot, breakable things. With two caterers, there needed to be enough room for them both to work comfortably in the space. We happen to have a little red Coca Cola bar, so we used that to serve over. The floor was black and white checker linoleum. We got the floor at Home Depot in the remnant section of flooring for about $40 (4x6). Good thing we laid it out early. It takes a while for the edges to lay down flat. We also used electrical tape to tack down the edges to avoid tripping. Since this party happened before this website, the photos are limited here, but it's an easy set up. In the. photo above you can see the bar we served over. The caterers worked behind the bar where the tables were all set up. There was even dancing at the diner. The 1950s party was a great party!